Capabilities — Federal Screen Products Inc.
We are constantly expanding and automating our manufacturing capabilities to offer the highest quality and expedited services. Keeping all work in house allows us to offer accuracy and consistency. 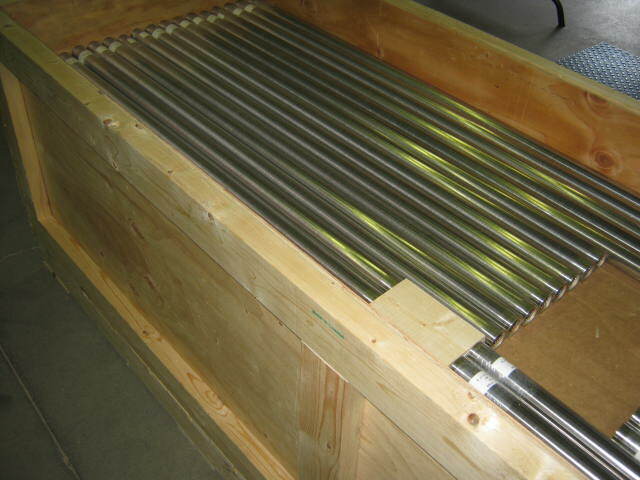 Federal Screen has the unique capabilities to build onto our manufacturing processes, reviewing, adjusting key parts of our manufacturing process catering to our work flow value and type. The service we deliver is just as important as the product we manufacture. 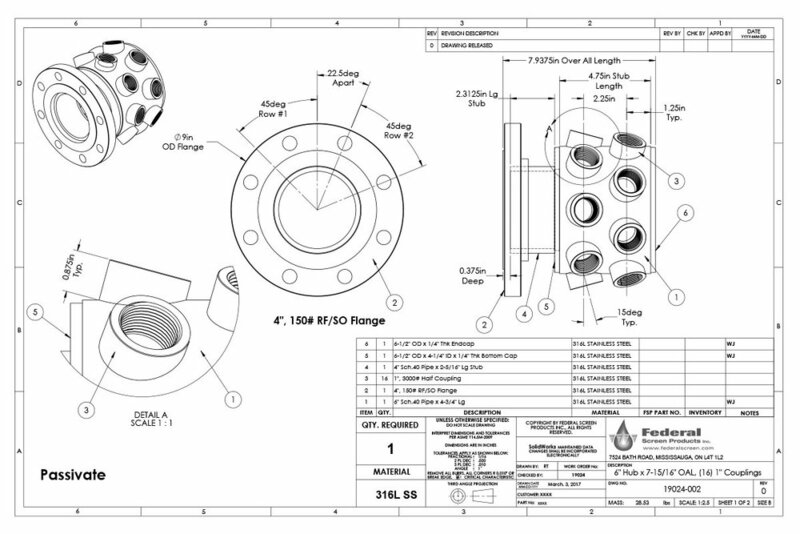 Our engineering team is able to expertly accommodate our customer’s technical parameters to meet their exact needs. Over the years we have built an efficient process of moving work through our office getting the job to our engineering team as fast as possible. Once the job is reviewed and the information is gathered approval drawings are created and sent to our customer which allows them to gain complete confidence and ensures no details have been overseen. Our staff is highly trained to review and process technical information (engineering drawings, spec sheet for systems etc.) resulting in a solid design. With the volume of screens we process, we are constantly looking for better and more efficient manufacturing means, which drives our competitiveness. All our welding procedures conform to ASME. We have in house threading capabilities up to 4” pipe. Each thread is gauge tested. Our welding department is well equipped to weld a host of nickel alloys such as 304L SS, 316L SS, Hastelloy C-276, Monel 400, Alloy 20, Titanium, Duplex and Super Duplex, as well as various carbon steels. A new generation of robots is here which have offered great benefits to our industry. These robots are smarter, more mobile, more collaborative and more adaptable. This brings a major change to our shop floor and great benefits that increasing our compatibility and overall turnaround time. Industrial robots are on the verge of revolutionizing manufacturing. As they become smarter, faster and cheaper, they’re being called upon to do more. Federal Screen has taken advantage of this technology to stay ahead of the game. Finished product will be pickled and passivated. 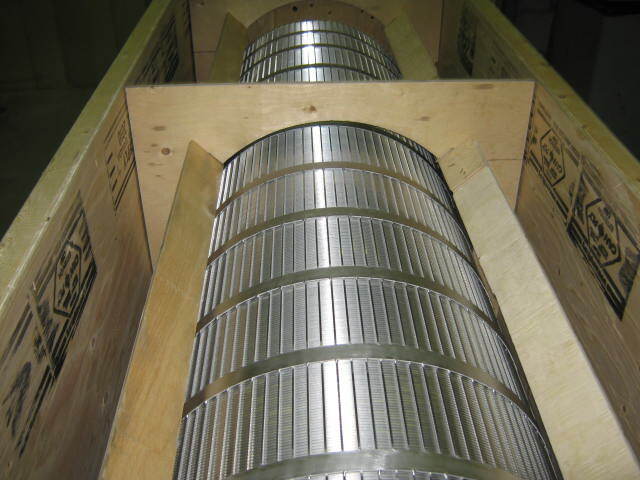 Federal Screen offers dynamic products to our customers to best address their filtration needs, thus delivering them with sufficient operating solutions. It all starts with our sales/engineering team breaking down the job and its unique requirements. The customization starts in the first phase of production with our custom-built screen machines designed to be dialed in suiting the customer’s requirements. 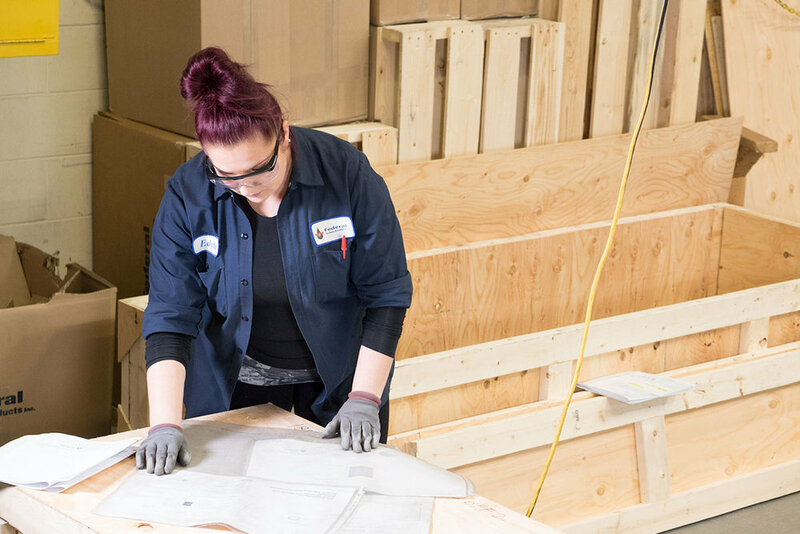 After the screen is ready for fabrication our knowledgeable and experienced technicians take over completing the job on time and to the job’s exact specifications. Federal Screen caters to the industry precision demands and leave no detail behind. We provide top-quality workmanship and provide friendly service throughout the process. We take pride in our workmanship and take special care when it comes to making sure our product reaches our customers safe and sound. The first thing our customer sees is our packaging and no exceptions or short cuts are taken when it comes to designing our crates. On jobs that require multiple pieces to be shipped together, we ensure all items are clearly labelled and secured in custom designed crates so no movement occurs during transport. On smaller items, we use triple corrugated carton and overlapping flaps; or for mid-range sized orders plywood reinforces bases. Federal Screen is able to supply its customers with a wide assortment of documentations in order to further guarantee its product quality and assurance. 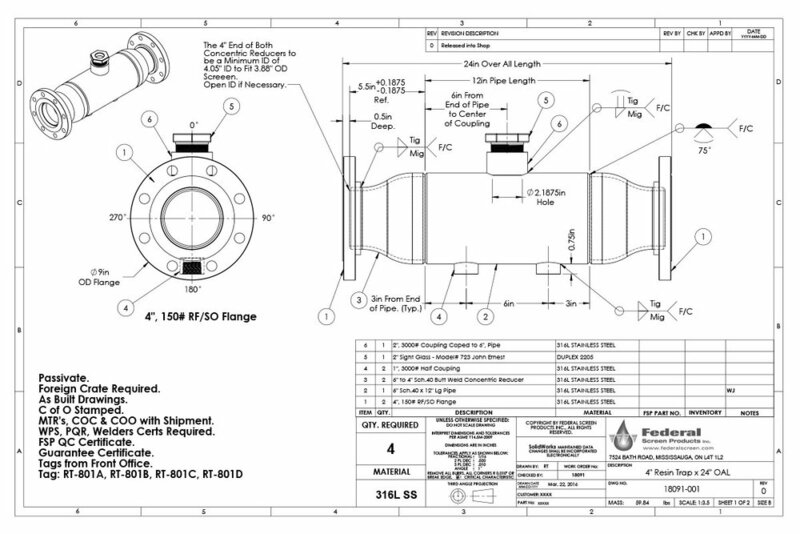 Some commonly requested documents that Federal Screen is happy to provide are: Welding Procedure Specifications, Material Collection and traceability, Weld Qualification/Inspection Reports, General arrangement drawings, Design and Technical Information calculations or insights, product installation packages, and PQR’s. After intense comparison over technological advancement and capabilities we selected a FLOW CNC water jet cutting machine. Our machine is capable of cutting a maximum 7” thick stainless steel plate and can accommodate a 6 ft x 12 ft sheet, all while cutting at 60,000 psi. With further modifications we are capable of cutting burr free holes in pipe for laterals and headers. This gives us extreme accuracy in lateral spacing when retrofitting older vessels. We specialize in custom manufacturing. Our sales, engineering and production teams have the experience to manufacture what you need to the highest degree of excellence. Keeping all work in house allows us to offer accuracy and consistency. 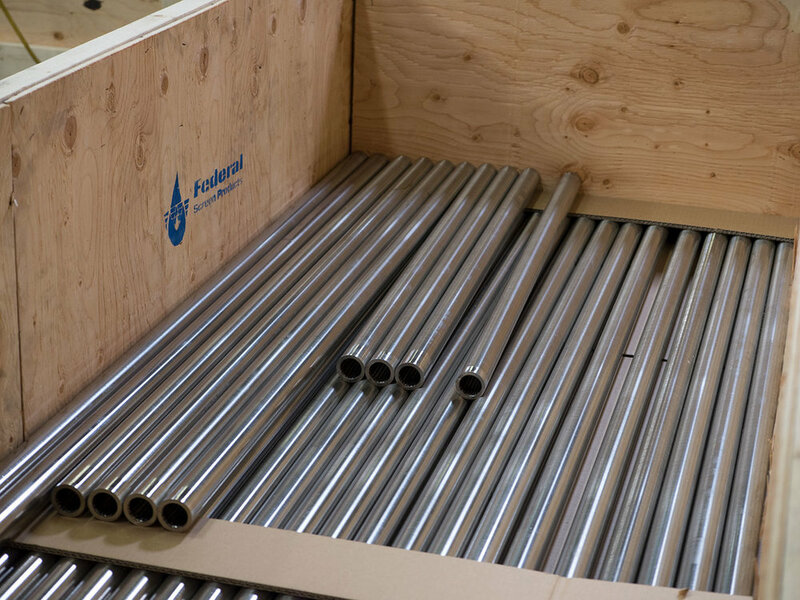 Federal Screen has the unique capabilities to build onto our manufacturing processes, reviewing, adjusting key parts of our manufacturing process catering to our work flow value and type.